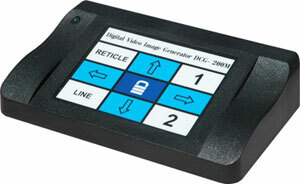 The Digital Crosshair Generator modules are designed for use in S-video and composite signal video systems to display a crosshair or reticle image on the live monitor view of an analog camera system. 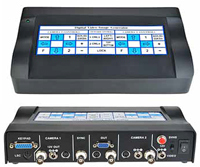 The digital video crosshair generator module is inserted in the signal path between the analog camera and the monitor using either an S-video or composite interface cables. We offer two models that offer a variety of features. 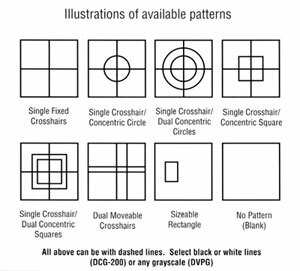 The DCG-200M creates seven different reticle patterns; single crosshair (rotatable), fixed in center single crosshair, dual crosshair, box, single crosshair with 2 sizeable circles, single crosshair with 2 sizeable squares and arrow pointer. The DCG-100A provides a single, fixed crosshair. Both models provide a choice of line types : solid white, solid black, dashed white, dashed black.